The most basic presentation feature we offer, Display mode allows users to hide AppInsights menus for a larger dashboard view that is ideal for group viewing around a single monitor or screen. If you’ve made the decision to hide the AppInsights dashboard header or footer -- see our Basic Styling tutorial -- these changes will be reflected in Display mode. 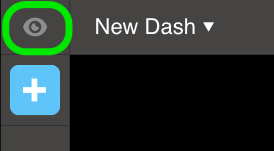 Hit the eye icon at top left of the dashboards to toggle Display mode on and off. If you’re interested in sharing a live dashboard with a colleague or customer without offering editing privileges, you’ll want to use our share link feature. Share links are also ideal for representing a dashboard permanently in a company lobby, conference room, or call center as they simply require an active browser tab for proper representation. Your AppInsights dashboards are compatible on mobile devices with modern browsers such as Safari on iOS or Chrome on Android. Whether you’re viewing a share-link or have logged in to the AppInsights application, your dashboard will automatically optimize to fit your screen. Please note that vertical stacking is not available for dashboards that are accessed from a mobile device. The layout of the dashboards will imitate what you are used to seeing on a standard computer or laptop screen.